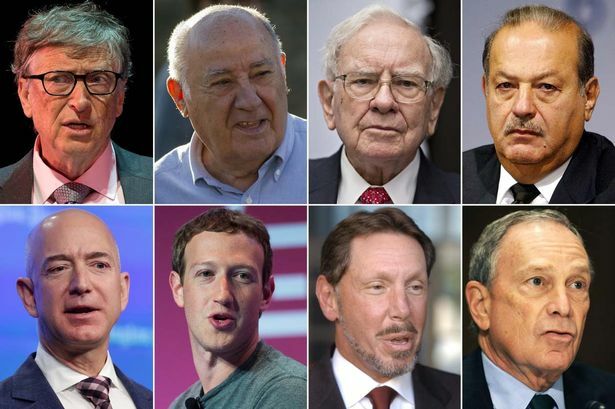 A report by Oxfam, an anti-poverty organisation, has revealed that eight men own the same wealth as the 3.6 billion people who make up the poorest half of the world’s population. The report, titled ‘An economy for the 99 percent’, was released on Monday ahead of the World Economic Forum meeting opening in the Swiss ski resort of Davos. Oxfam used the Forbes billionaires list published in March 2016 to make its claim, saying the new data on wealth distribution from countries such as India and China had prompted it to revise its own calculation, having said a year ago that the wealth of half the world’s population was in the hands of 62 people. According to the Forbes billionaires list, the world’s richest men are Bill Gates, founder of Microsoft at $75 billion; Amancio Ortega, the Spanish founder of Inditex a fashion house; financier Warren Buffett; Mexican business magnate, Carlos Slim Helu; Amazon boss, Jeff Bezos; Mark Zuckerberg; Oracle’s Larry Ellison and Micheal Bloomberg, former mayor of New York. “Inequality is trapping hundreds of millions in poverty; it is fracturing our societies and undermining democracy. The measures that could reduce the inequality, as listed by the organisation, are: higher taxes on both wealth and income to ensure a more level playing field, business leaders who commit to paying their fair share of taxes and a living wage to employees, and greater international cooperation by governments to ensure that workers are paid decently and the rich don’t dodge their taxes.